Celebrate the Super Bowl With Popcorn: Make DIY Football Popcorn Jars! The big game has finally arrived! In a mere five days, the 49ers and the Ravens will duke it out for the Super Bowl XLVII championship title. But before your favorite players hit the field, you’ll need to supply your Super Bowl party guests with loads of munchable goodies. The best treat for watching those great plays? Popcorn, naturally! Suit up everyone’s favorite snack with these fun and easy-to-make football popcorn jars. They’re sure to score a touchdown with your biggest fans! To make the football sleeve for your mason jar, lay a sheet of brown construction paper flat on a table. Using a ruler and a pencil, trace a rectangle onto the construction paper. The rectangle should be wide enough to wrap all the way around your jar and tall enough to cover the jar from top to bottom. The mason jar we used is about 2 ¾ inches in diameter and 4 inches tall, so we cut a rectangle that measures 2 ¾ inches by 9 inches. Carefully cut out the rectangle. Now it’s time to make your football laces. Use your ruler and pencil again to trace six very small, thin rectangles onto the white construction paper. They should be small enough to fit onto the brown rectangle and create a football lace pattern. One of the white rectangles should be longer than the other five. Our longer lace measures ¼ inch by 2 ½ inches, and our five shorter laces measure ¼ inch by 1 ½ inches each. Lay your brown rectangle horizontally on the table. Using glue, attach your long construction paper lace vertically in the center of the brown rectangle. Then, attach each of the five remaining short laces horizontally right on top of the long lace. Make sure to evenly space out your short laces. Your football sleeve is ready! All you have to do now is tightly wrap it around your mason jar and secure it with some tape along the back. If you want your football to look even cuter, tie a piece of twine around the mouth of the jar. Repeat steps 1 through 4 for each mason jar. Fill the jars with your favorite football popcorn flavors and serve to your pigskin-loving friends! We used Cheese, Buffalo Ranch, Chocolate Drizzle and Almond Pecan. What other kinds of football-shaped food will you be serving at your Super Bowl Party? You’ve been a Giants fan since the first time you slept in a cradle. Your best friend, a Jets fan, bleeds green and white. Both of you grew up in New York, but you each have very different opinions when it comes to football! When two ironclad NFL teams dwell in the same state, diehard hometown fans are bound to be split straight down the middle. So the next time you and your friend are chowing down on your sports-themed popcorn and playfully bantering over which team is best, swap these fun stats about how these popular in-state rivals match up to one another! First Game: The very first time the Giants and the Jets battled against each other, in true New York fashion, was November 1, 1970. The Giants came out on top with a score of 22-10, setting a trend for future bouts. Most Recent Game: The latest game that brought the Giants and Jets face-to-face was on December 22, 2011. Like their name implies, the Giants claimed a colossal victory once again with a score of 29-14. Overall Head-to-Head Matchups: Out of the 12 games the Giants and Jets have played together throughout NFL history, the Giants have won eight, proving they’re the toughest team on the block. Super Bowl Wins: The Giants have been crowned Super Bowl champs a total of four times; the Jets only earned the title once. Think you can pull one over on the big guys that easily? Fuhgettaboutit. First Game: On November 19, 1933, the Steelers and the Eagles had their first clash. The Eagles soared above their challengers with a score of 25-6. Most Recent Game: These two opponents last went up against each other on October 7, 2012. This time, the Steelers won by a split hair: 16-14. Overall Head-to-Head Matchups: The Steelers and the Eagles have been matched up a whopping 77 times, with the Eagles boldly taking the spotlight for 48 of those games. Super Bowl Wins: When it comes to the big game, the Steelers are the conquering heroes with six Super Bowl victories. The Eagles have yet to swoop in and nab the top prize, even though they’ve competed for it twice. First Game: The Cowboys only recently butted heads with the Texans: Their first game was on September 8, 2002. This was the first and only time the Texans beat the Cowboys, with a score of 19-10. Most Recent Game: On September 26, 2010, the Cowboys came charging in and triumphed over the Texans, 27-13. Overall Head-to-Head Matchups: The Cowboys take the cake: They’ve won two out of the mere three games they’ve played against the Texans. Super Bowl Wins: The Cowboys have lassoed in five championship victories over the years, but the Texans haven’t yet made their Super Bowl debut. Time to saddle up and win some titles, boys! Are you a fan of another team that has a hometown rival? Tell us why you think your team is the finest in the state! The Holiday season is in full swing for us at The Popcorn Factory, and certainly with you too! We’re planning so many great things for Thanksgiving and our Winter Holidays that we can’t wait to share them with all of you. Of course, all of our attention and focus right now is on one of our favorite Holidays: Thanksgiving. Being the popcorn and Holiday savvy poppers we are, we know that Thanksgiving and popcorn go hand in hand! Popcorn was around for the very first Thanksgiving Day dinner in Plymouth, Massachusetts (and was a sure-fire hit if we do say!) Bags of popped corn were brought to the first Thanksgiving feast as a gift from the chief’s brother. Native Americans made popcorn by holding an oiled ear of corn on a stick over fire and then eating the popped corn off of the ear! Colonists later incorporated popcorn into their daily meals and began using popcorn with milk or cream, and sugar, making it the first known breakfast cereal! (I bet our secret recipe caramel popcorn or kettle corn would be perfect to try this way!) This is just another example of popcorn leading the way in tasty snacks and meals. Popcorn is the ultimate Thanksgiving tradition, so why not make it apart of yours? Light, fluffy, and made with delicious and innovating flavors, our popcorn complements any occasion or meal. You can enjoy our real buttery popcorn as a before-dinner snack while you’re watching the Macy’s Thanksgiving Day Parade. Chomp down on our natural cheese popcorn without ruining your appetite, as you watch and root for the Packers or Lions, Dolphins or Cowboys, and the 49ers or Ravens! 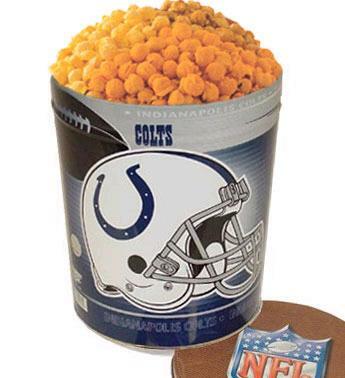 (Not to brag, but we hear our popcorn tastes even greater than a win when coming from one of our many NFL popcorn tins that we offer). Just finished a huge Thanksgiving dinner but you still want dessert? Our secret recipe caramel popcorn makes the perfect post-Thanksgiving dinner dessert. This buttery and sweet combination is a super satisfying treat and goes perfectly with any turkey, potato, or green dish (plus, who are we to shake up a several century’s long tradition of popcorn at Thanksgiving!) Simple and tasty to eat, without putting a strain on an already full stomach! We’ve been popping since 1979 with fresh, fun, and delicious popcorn flavors, so let us be your popcorn experts this Thanksgiving holiday and get a great snack that you can be thankful for! Another school year is here! It’s time for buying books, going to classes, late-night study sessions, and the occasional paper or test. Or perhaps this is yours or your loved ones first year going away for college and making a fresh start. No matter which case, it is always a fun, exciting (and maybe a little scary) time for everyone. During this crazy and busy school time, we know that it’s the comforts of home that everyone looks forward to most. Whether you’re sending a care package, homecoming gift, study snack, or even their favorite snacks, it will definitely be appreciated (and maybe you’ll even get a phone call home!). We like to think that we’ve perfected our own kind of college survival kits and college study kits; the perfect gifts to let your little think-tank know that you miss and support them…and that you don’t want them to starve when they’ve run out of late night snacks and the campus store is closed! A delicious popcorn treat can really help keep focus for an all-night study session, and is the perfect between meal snack to keep them full and happy. These tins are also perfect for fast approaching Homecoming weekends! Show your school pride if you’re an Illini, Badger, or any of your other favorite mascots. These college team tins are great to bring to any tailgating parties, mid-game cravings, or a delicious gift to any alumnus. We don’t like to brag (too much) but we bet if they shared one of our delicious sample popcorn tins with our secret recipe caramel, or our real cheese cheddar popcorn, they will be making friends in no time. Several of our snack tins include our favorite flavors of popcorn like butter, white cheddar, or secret recipe caramel. They also include a variety of tasty bites like cookies, chips, candy and many more sweets to keep your scholars satisfied. We can even personalize the messages on the tins with a picture or note (this would be the perfect time for any silly family photos from home). When they’re done with the goodies inside, the tins are perfect for storage and decorated with your University’s logo and colors or fun, bright designs so that they can easily fit in with the dorm décor. So what do you all think? Let us know in the comments what would be in your ultimate college survival tin? Don’t forget to check us out on Facebook as well!